1946 N Birch Street, next to Fossil Cove Brewing Co.
At Wicked Wood Fired Pizza, our pies are created from the bottom up. We start with 100% organic sourdough crusts, made with a 16-year old sourdough starter from the kitchen of Dough Master Bryan Brandon. The long fermentation process of the sourdough makes it easy to digest and, when you take that first bite, activates your taste buds to take you straight to flavor town. Each pie then gets topped with a delicate balance of house-made marinara, sauces, meats and fresh, seasonal veggies, then charred to melt-in-your-mouth perfection in our wood-fired Italian-made oven. Simple, delicious and wicked good. Wicked Wood Fired Pizza is located next to Fossil Cove Brewing Co. in the heart of Fayetteville. Fossil Cove has twelve rotating taps including year round, seasonal and experimental beers. Cider and wine is also available. The brewery is family-friendly and dogs are permitted on the patio. Check out Fossil Cove Brewing Co. for their brewery tour schedule, event dates and beer releases. Wicked Wood Fired Pizza - Mobile is always on the go and every week is different! From taprooms to craft fairs, to office lunches and making a "I do!" a little more delicious, there's nothing better than munching down on some wicked wood-fired awesome out and about. To request Wicked Wood Fired Pizza for your next event, fill out a form here and we’ll get back with you! WHENEVER WE WANT AND WHEREVER WE WANT! Check out us out on on Facebook and Instagram for weekly updates. For centuries, the wood-fired oven has been the center of community - a place where exceptional food memories are made and fun times are had. Wicked Wood Fired Pizza’s mission is to create a funky, festive atmosphere of community through the time-tested tradition of wood-fired pizza that’s made on-site, just minutes before you take that first crispy, crunchy, cheesy bite. When we roll up to your wedding in our fully outfitted food truck, complete with all the wicked wood-fired awesome appetizers, pizzas and salads, we bring with us the nostalgia of times spent around the dinner table with family, of evenings spent with friends, and add a festive flair to the celebration of newly-wedded bliss. Starting at $14/person, our rates include everything you need to eat and enjoy your day. All prices are per person, so your guests can eat, and party 'til they're full! Don't worry, we've got everything covered!. $14/person: choose from our wicked wonderful menu! Have your guests enjoy delectable pizzas one of two ways! With buffet-style service, guests can grab a plate and embark on wood-fired adventure of flavor. With walk-up service, guests can dance, party and eat at their own pace. 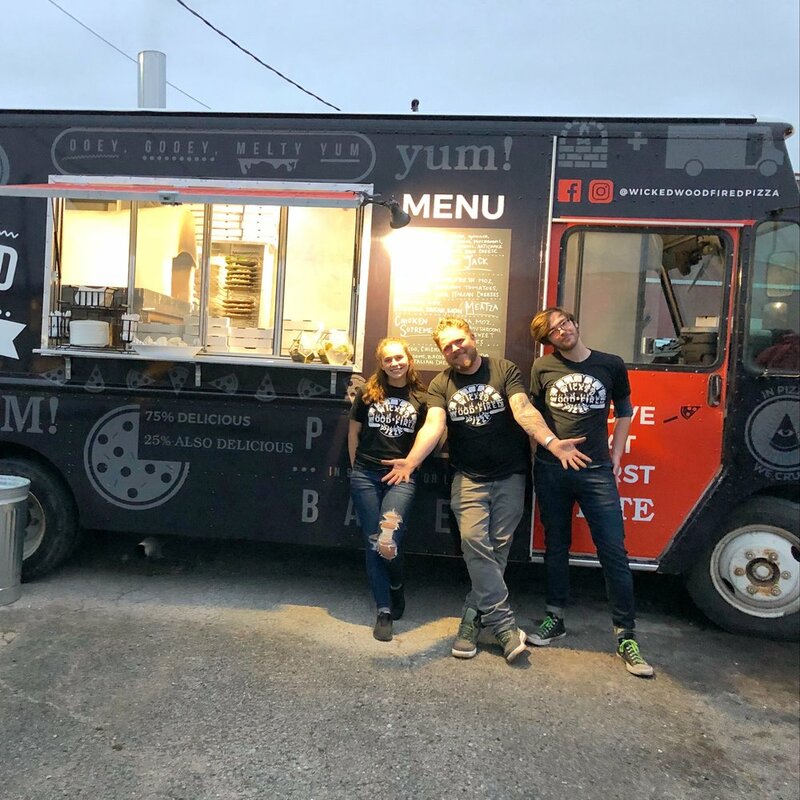 We'll take their order in traditional food truck style and in just a few minutes they'll be walking away with fresh, piping hot pizza. Want to know more about what WWFP catering looks like? Click the FAQs button to have your questions answered! I WANT WICKED WOOD FIRED PIZZA AT MY WEDDING! Awesome! Wicked Wood Fired Pizza would love to be a part of your special day! Fill out the form below, and resident Boss Lady Alexandria will get in touch! Anything You'd Like Us To Know About Your Wedding Day? HAVE US CATER YOUR NEXT GREATEST PARTY EVER! Nothing makes an event quite like pizza! In addition to wonderful wicked wedding caterings, Wicked Wood Fired Pizza rolls all over Northwest Arkansas for all sorts of fun events! From corporate holiday parties and grand openings, to festivals, end-of-school bashes and craft fairs, we do it all! Fill out the form below and we'll be in contact! Bryan Brandon founded Wicked Wood Fired Pizza at it's Dickson Street location in 2013. Bryan is a French-trained baker, with a Degree in Baking Science from Kansas State University. He is the Head Baker at Ozark Natural Breads, which his family founded over 30 years ago. Alexandria Freeze joined the Wicked Wood Fired Pizza Team in 2015 after quitting her corporate job in Kansas City. She manages all things Wicked, from wedding and corporate catering, to recipe creation, and doling out sass, nonsense and occasional wisdom. No one makes great pizza alone! 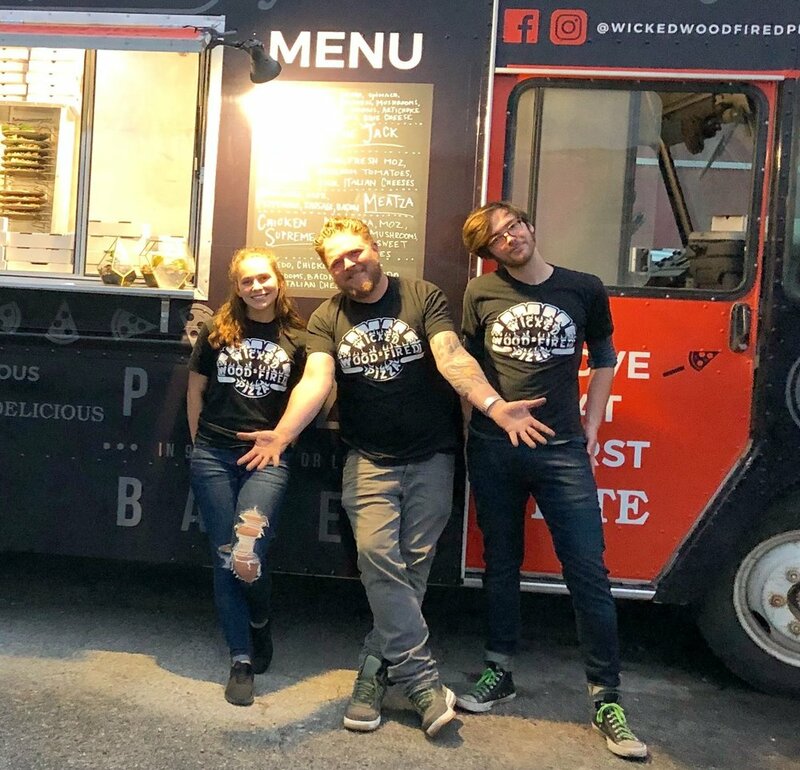 As Wicked Wood Fired Pizza has grown, our wicked awesome team has grown with us! They are the heart and soul behind each each and every pizza. LIKE PIZZA? WANNA WORK WITH US? Do you want to be part of something unique, exciting and rewarding? Did you answer yes, yes and yes? Do you have drive, passion and a cheery disposition? Yes, yes, yes? Well, shoot us an email and tell us a little bit about yourself. We can't wait to meet you! Questions? Comments? Thoughts? Feelings? Pizza suggestions? This is the place! Shoot us a message, and we'll get back to you!